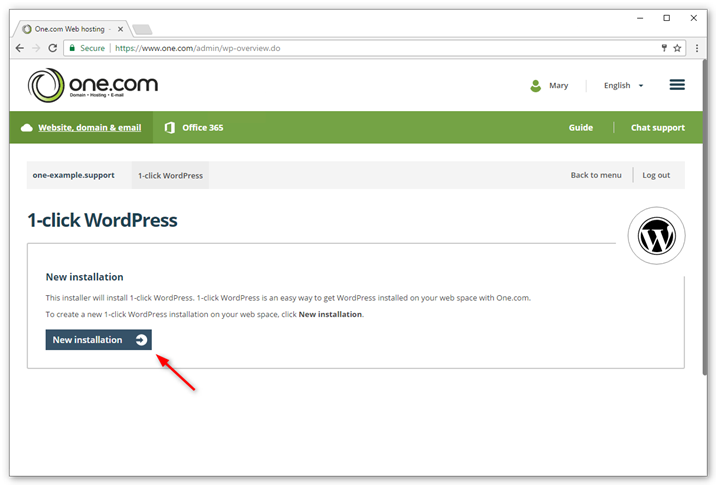 Follow these step-by-step instructions to install WordPress on your web space with the 1-click installer. 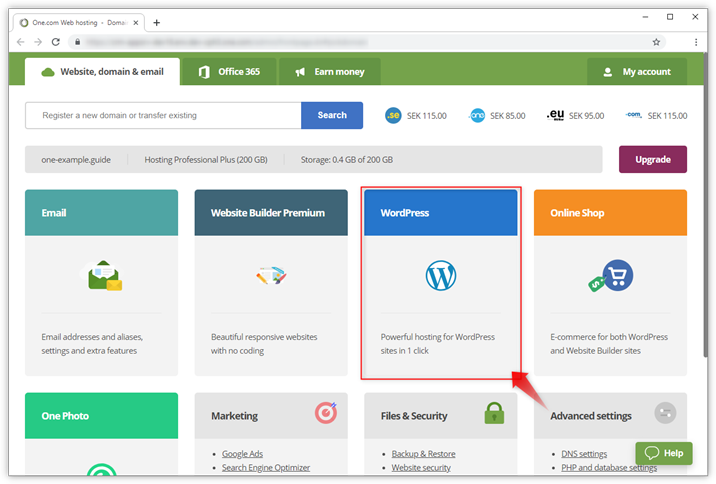 Log into your One.com control panel and click WordPress. 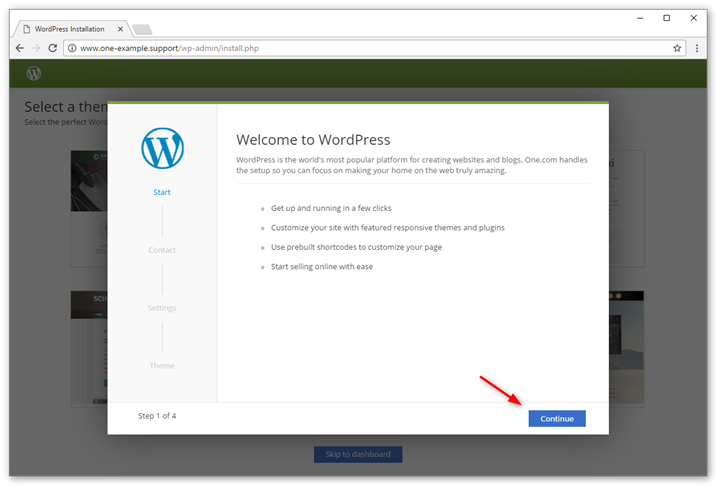 Click New installation to create a new WordPress installation on your domain. 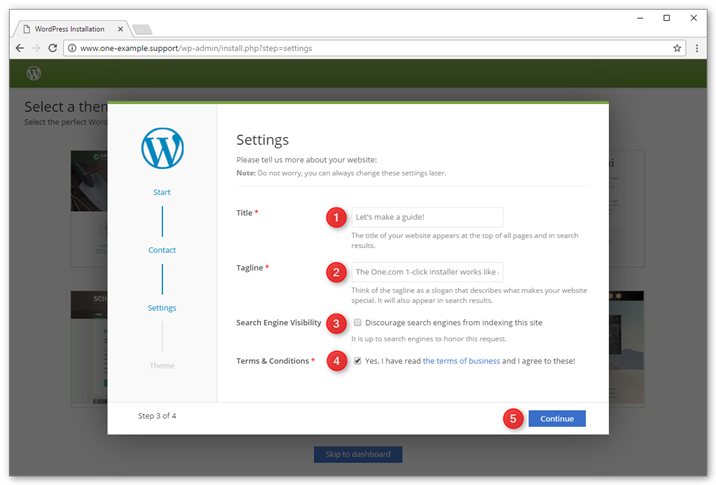 Select a language your WordPress administration. Choose a location for your website. You can select the root directory of your domain, or type in a sub domain. 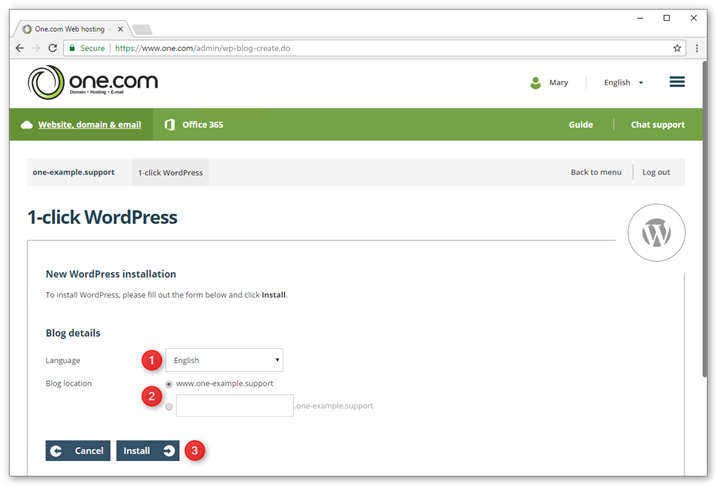 You have now started the WordPress installation. Click Continue. 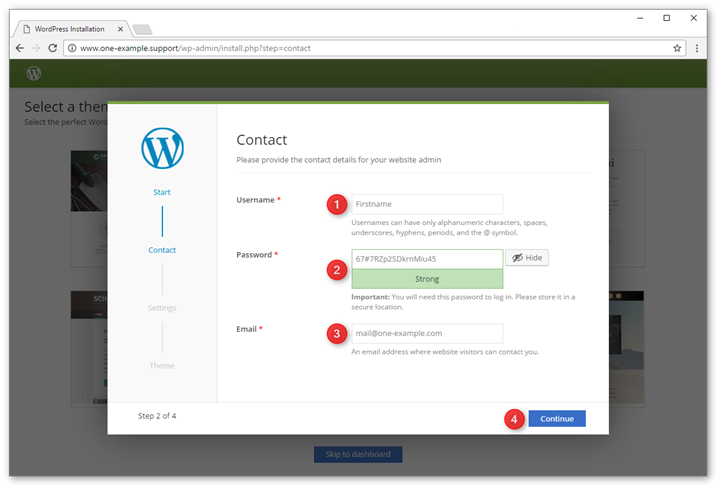 Enter a username, you will use this to log on to your WordPress administration. Choose a password for your WordPress username. Enter an email address, this will be your primary contact for WordPress, for example if you forgot your password. You need to choose a title and tagline for your WordPress site. You can always change it again later. Choose a title for your website; it will be visible in your browser tab. Enter a tagline for your website; it should be a short catchy quote that supports your title. If you don't want your site to show up in search engines, check the box. Check the box to agree to the terms of business. You can select a One.com WordPress theme for your website. The themes are designed with ease of use in mind. Our themes support the import of demo data, so that you only need to replace text and images with your own. Hover over a template and click Preview to see how your site would look. Click Install if you want to use this theme for your site. Would you rather use another WordPress theme? 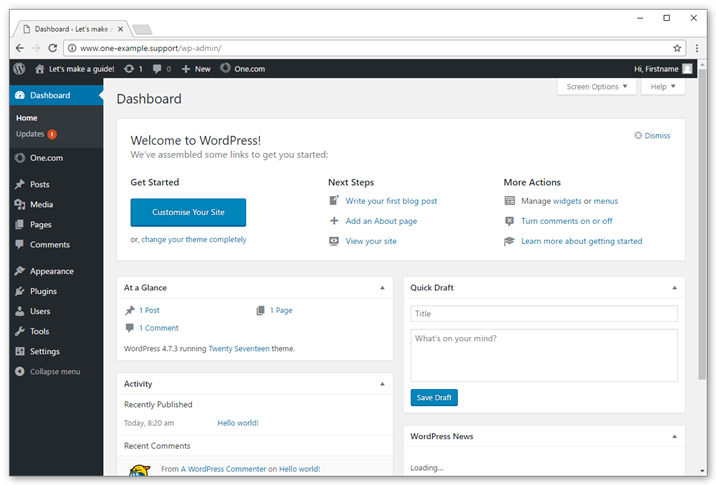 Click Skip to dashboard to start with the default WordPress theme. That's all! Your WordPress site is ready. 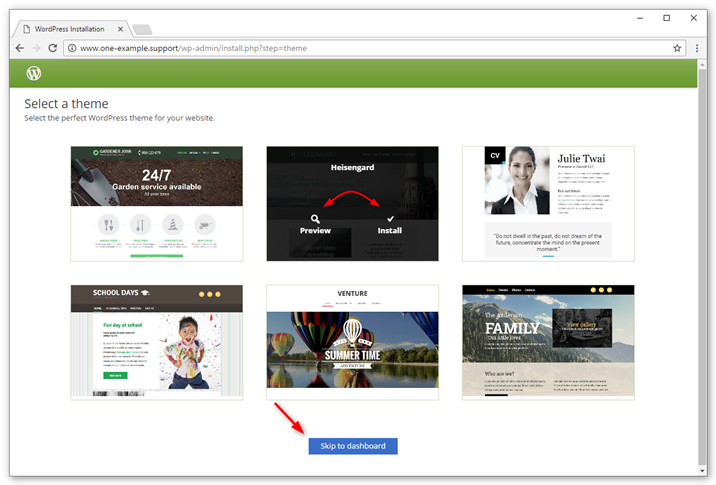 You are now logged in to your WordPress dashboard and can start to personalize your site.